Who said learning has to be boring? There is a revolution happening...it's called Serious Games. And it's here...now! 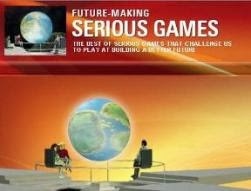 Serious games are designed for a primary purpose other than pure entertainment and are used by industries such as defence, education, scientific exploration, health care, emergency management, city planning, and engineering. 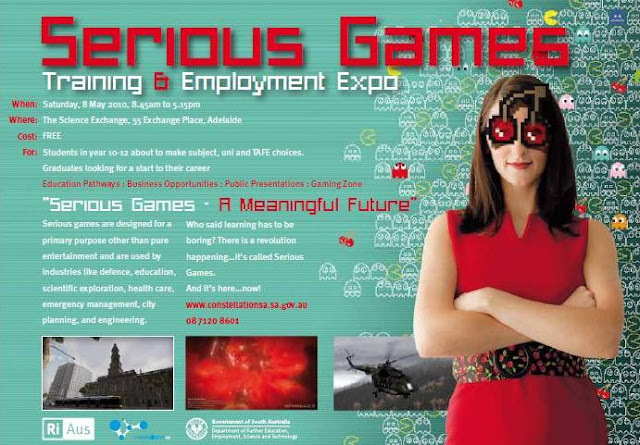 Aimed at stimulating employment in a dynamic and proactive environment, the Serious Games Training & Employment Expo brings together the expertise, innovation and know-how of a wide range of organisations to create training and employment opportunities for the benefit of South Australia's innovative, creative, enthusiastic and highly talented young people. This expo is for conversations about the many opportunities available for young people to enter into a career beyond video games, fulfilling talent and actually making a real difference in the world. During the event, 4 public presentations - 45 minutes each - will cover topics such as education pathways, launching your career, preparing your portfolio and understanding the sector. The presentations will be given by professionals who currently work in the field, and will take place in a room with a seating capacity of 100. They are FREE to expo visitors. 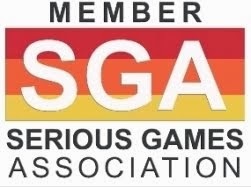 Setting the Scene - The purpose of this presentation is to introduce you to the serious games industry, including what it is, where it can be applied, and its links with other industries. Education Pathways - The purpose of this presentation is to allow a panel of education experts to share their knowledge and insight into selecting the right course to suit an individual's learning needs. This presentation complements the Opportunity Zone - Education area. Launching Your Career - Marketing Yourself This session is designed to provide you with strategies for success in moving from education into a serious games career, whether it is in an existing organisation or setting up your own. Strategies range from preparing your portfolio to marketing yourself and everything in between. A Day in the Life - Ever wonder what it's like living in someone else's shoes? Or exactly how they got to where they are within their company? Ever wonder what someone's job is really like? How do they really negotiate the twists and turns of the working world? With so many courses out there, how do you know which is best for you? The Opportunity Zone - Education is the ideal forum for individuals wishing to access the latest informatino on vocational training, college and university programs currently available in South Australia within the computing, design, screen and media fields. This Zone will help you find answers to your questions and give you resources to help you make the right training course. Visitors can meet qualified representatives from all three South Australian Universities and TAFE SA - all in one location. The Opportunity Zone - Business provides the opportunity for local South Australian businesses to share their expertise, innovation and know-how of the field with individuals who are keen to enter or start a small business in the field. This Zone gives you the chance to have a more detailed one on one with experts in the field and have your questions answered. •AVCon•Holopoint Interactive•I Love Biscuits•MegaMore businesses will be added as they confirm their attendance.